FRANKFURT (Bloomberg) -- German supplier Continental predicts a fifth consecutive year of record sales after deliveries of parking-assistance and braking electronics helped revenue rise 2 percent in 2013. Sales this year will jump 5 percent to 35 billion euros ($47.8 billion), the company said today in a statement. Full-year 2013 revenue increased to 33.3 billion euros. Adjusted earnings before interest and taxes in 2013 totaled 3.7 billion euros, or 11.2 percent of sales, beating the company's forecast of at least a 10.5 percent margin. The manufacturer, also Europe's second-largest tiremaker, has focused on developing components that help automakers reduce vehicle emissions, increase auto safety and enable communication links. Continental was able to partly bypass the effects of an industrywide slump in Europe by following German customers Volkswagen Group, BMW Group and Daimler into growing markets such as China and the United States. "Continental has had a good year behind it, and the perspective for 2014 is right," Juergen Pieper, an analyst at Bankhaus Metzler in Frankfurt, said by phone. "Continental is present in all areas that are seen as growing at double-digit rates, especially in assistance systems, electric and hybrid-engine parts and navigation." The supplier reduced its 2013 revenue forecast on Nov. 7 from an earlier prediction of 34 billion euros in sales, citing currency effects. The dollar fell 4 percent against the euro last year, and the yen declined 21 percent, according to data compiled by Bloomberg. Exchange-rate moves lowered sales last year by 700 million euros, Continental said today. Continental seeks to "comfortably achieve a double-digit adjusted-Ebit margin" in 2014 as the manufacturer expands faster than the car industry's estimated 2 percent production growth to 85 million vehicles, CEO Elmar Degenhart said in the statement. Net debt narrowed to about 4.6 billion euros at the end of 2013 from 5.32 billion euros a year earlier, the company said in a separate presentation. 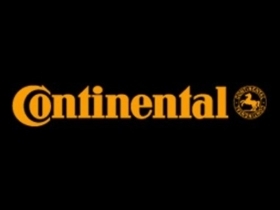 Standard & Poor's, Fitch Ratings and Moody's Investors Service all raised Continental's debt last year to investment grade after borrowings stemming from the takeover of the former Siemens car-electronics unit VDO in 2007 were scaled back. Net interest expense this year will probably fall by about half in 2014 to less than 400 million euros, the company said in the presentation. Fourth-quarter sales amounted to 8.4 billion euros and adjusted Ebit advanced to 925 million euros from 903 million euros a year earlier, it said. The manufacturer is scheduled to present detailed earnings numbers on March 6.